Got a bored pet? Or you just want them to have fun while you work on something else? A fantastic way to achieve both is with automatic ball throwers for dogs as these simple toys can bring hours of incredible entertainment. My Labrador Nora was thrilled when I got her one of these toys. You can train your dog to return balls to the opening and the machine will launch it again so your puppy can enjoy fetching balls without your engagement. Should you Avoid Cheaper Ball Launchers? These AC or battery-operated machines can shoot the balls across your backyard over a distance of 10-30 feet. But, this is where we face problems. Cheap, low-quality launchers aren’t something you want to buy. They can be quite annoying due to their constant breaking and an array of different problems. Also, if you’re not familiar with fetch toys, you will probably be overwhelmed with the sheer number of these products that are currently on the market – there are dozens and dozens of different models. Our goal is to make this decision easier by presenting you the best automatic dog ball throwers in the form of comprehensive and unbiased reviews, making sure that you find the right device for your pet’s needs. Read on and you’ll see which ones are our favorite for 2019. This is an immensely popular auto ball thrower, beloved by the users all over the world and it was even featured in the various talk-shows about pets. It also won numerous awards, so there was no way for us to avoid taking a more detailed look at it. When we opened the box, we found three main components of the package inside of it – the thrower itself, the AC adapter, and the set of three mini tennis balls. The iFetch ball launcher looks absolutely amazing – it features a blue-and-white color scheme and has rounded edges and rolling curves, which gives the whole device a modern look. One can adjust the throwing power to 10, 20, or 30 feet by pressing the button that’s on the back of the device, above which are the LED lights to indicate the current setting. As we already said, the launcher uses mini tennis balls (2″) – this is perfect for smaller dogs, while others can use iFetch for bigger dogs. Weighing only 2.5 lbs, the device is very easy to transport, and it also gives you an option to use 6 C batteries when you’re not near a power source. Most of the users are very pleased with the performance of this thrower – and we tend to agree with them. Our only complaint is that the included balls don’t look very durable, but you can easily replace them – the product itself is just amazing and definitely worth getting. Yes, your guess is correct – this would be the larger version of the popular iFetch, able to shoot the full size tennis balls. It’s a quality product, and one highly praised by the users. Owners of medium to large dog breeds were quite disappointed when the original iFetch came out – due to the usage of small-sized balls, they weren’t able to train their large pets with it. Fortunately, the new launcher is three times bigger and uses the heavy tennis balls, while its weight stands at 12 lbs. Along with the device itself, the box also contains three balls of standard size, an AC cable, and the (pretty useful) instruction booklet. Just like its smaller cousin, this one also looks sleek and modern, while requiring no additional assembly. It has a distance slider, the distance status lights, and a power button. When it comes to sheer performance, the iFetch Too is very close to the claimed distances, giving consistent throws and working without any major problems. We really liked the powerful battery – once you charge it, you can get close to 250 launches with the device! Many pet owners claim that this is the best of all full sized dog ball throwers. In our opinion, the device is almost flawless – on one occasion, the ball got stuck inside the machine, and we had to intervene. But this is still a well-made and reliable product, and it has our recommendation. Playball is undoubtedly one of the most affordable devices of this type on the market. But does its price have an adverse effect on its functionality? It features a pet-friendly design with a big opening on the top, allowing the dog to easily place the ball inside of it. The pet owner can use one of the three different distance settings, with the highest one being ideal for the outdoor fun. Playball can be used both outside and inside the house, as it uses both the power cord and the rechargeable batteries. It comes with three smooth, saliva resistant balls that can’t get jammed inside the device – nothing stops the fun! It’s an excellent choice for those looking for a good ball launcher that comes at a reasonable price. Read our full review and find out everything about its features! With attractive looks and the innovative feature of rewarding the dog with treats during the game of fetch, the BallReady looks like the ultimate ball throwing solution. But is it really so? This product can feed your pup every time he retrieves the ball – it has a plastic plate on the side and can provide your pooch with his favorite food. The owner can also set the machine to let out the food in preferred time intervals, allowing him to leave the house with a peace of mind. The included Lithium-ion battery is another great thing here – it will enable you to use the machine in your yard. All of these perks combined make this ball launcher a superb choice for the owners of active pets. Read our full review and find out why it is the favorite of so many pet parents! With its modern and sleek looks, the PetSafe surely stands out when it comes to visuals. What about the features and the performance? The first thing to notice about this product, along with its good looks, is the fact that it has whopping nine range settings, which is a lot more than many others. Once can set the distance by using the knob that can found on the side of the machine, and there are even the angle settings to shoot in different directions. Excellent! One other feature that we really liked is the safety sensor – it is located on the front of the device, and its function is to protect people and pets from the thrown balls to the distance of some seven feet away from the unit. If it detects the motion in this area, the launcher will pause for five seconds. This is great for safety, but we can already see that it will present a nuisance to some of the more impatient pets and their owners. Other people are praising the looks and performance, but many of them also find the motion sensor to be quite annoying on some occasions. We think that this is a great feature, making the launcher an ideal choice for those who have the safety as their primary concern. The guys and girls working at iDogmate know what they’re doing – their newest automatic ball launcher is one of the most praised models on the market. Is it the best device of this type? One of the greatest things about this product is its distance setting. It can launch the ball to 10, 20, 40, or 50 feet of distance, and there is also the “random” setting, which is great if you’d like to keep your pooch guessing. Switching between these lengths is incredibly easy, thanks to the included remote controller. The rechargeable Li-ion batteries allow outdoor use – with one charging, the iDogmate will be able to throw the ball up to 1000 times! Competitively priced, the iDogmate stands as one of the best ball launchers that money can buy today. We like it! The GoDogGo has a great number of useful features – like the launching remote, the variable timing, and the ability to load more than one ball at once. Along with the main unit, we also found some other goodies in the box – there was an AC adapter, three tennis balls of the standard size, one rubber ball, and a remote control. The thing that you’ll immediately notice is the big, spiraling green bucket, which serves a ball-feeding chute. The bucket makes this launcher the only one on the market that can be loaded with more than just one ball, which just might be the feature that you’ve been searching for. The remote control is another great feature here – with it, the owner can easily change the throwing intervals, launch the ball, or put the device into the auto-launch mode. Of course, all of these things can be done directly from the fetch machine itself. Unfortunately, the GoDogGo does not feature rechargeable batteries, which is pretty disappointing. It also launches quite high into the air, which means that using it inside the room isn’t really a good idea. Overall, this is an excellent machine that works like just as advertised. Many reviewers praise the remote control and the wide ball chute, and we completely agree with them. We didn’t like the lack of rechargeable batteries, but the GoDogGo is still a good choice when it comes to entertainment for your pooch. This is, actually, the most important aspect to consider if you’re about to buy an automatic ball launcher, as not all devices are using the tennis balls of the same sizes. If you only do a quick research on the internet, you probably won’t realize that many of these models are using the 1.5″ “mini” tennis balls, which could be a choking hazard for your beloved German Shepard. Luckily, some companies, like iDogmate or iFetch, sell larger models of their launchers – these are using the standard 2.5 tennis balls. But if you’re an owner of a medium or small-sized dog, you can safely go with the original models that shoot the smaller tennis balls. Almost all of the automatic fetch machines are suitable for both the outdoor and the indoor use, and lots of them allow you to choose between the AC power or the battery operation. With this mind, an important characteristic to look out for would be the distance setting – if your plan is to use the thrower outdoors, you should look for devices with the furthest distance settings. On the other hand, if you want to use it inside the house or if your backyard is a small one, the machines with the lower range settings will suit your needs the best. The most frequent adjustments would be the 10, 20, and 30ft, while some launchers go all the way up to 50ft. One of your primary goals for purchasing this kind of machine is probably the desire to train your dog to use it on his own. If this is the case, we advise you to look for the automatic ball launchers that come with the wide ball chutes. This would be the area through which the ball can be dropped into the thrower, and a larger chute will make it a lot easier for your pet to learn how to use it. The GoDogGo ball thrower is one of the devices with the biggest “reloading” chutes on the market and is one of the easiest launchers to train your pet on. One other important thing to look out for is the sound – the dogs which get nervous around objects that make weird noises might have problems with the training, since the ball launchers tend to make some sound while they’re shooting the balls. So, the noise levels can be quite important. This one is a no-brainer – like with everything else, the price of the automatic ball launchers will vary widely from the one to another. You can expect to pay somewhere between $100 and $200 if you want a reliable product, and this is what we would recommend you to do, as the devices that come at prices that are lower than $100 tend to break easily, and are far less reliable. They also aren’t as durable as the more expensive models, so you won’t be able to use them for long. This one obvious. Your dog will happily run and retrieve the ball and, in that way, get much needed exercise. It is crucial for puppies to walk and run on a daily basis in order to stay healthy, as the prolonged periods of staying inside the house have a very bad effect on their health. Another pro is that these machines can have a very positive effects on the pet’s coordination stimulating its mind by making them get over all sorts of obstacles to catch the ball and bring it to the owner. If the owner is using one of those handheld chuckit! toys, he can be sure that the sessions will strengthen the bond between him and the pet – bringing the ball back to the owner only makes the dog’s love for the master stronger and deeper. Dogs can easily get bored if their owners are not around to play with them, and that is exactly why the tennis ball throwing machines were invented. The dogs just love them. These devices can do the same thing that their owners can, letting them play fetching game even when they’re alone in the house or the backyard. The handheld ones bring the same amount of entertainment to the owners – it’s always fun watching the dog happily run around picking the balls. When you’re teaching your pet how to play the game of fetch, make sure that you are doing it next to your machine of choice. In that way, your dog will be able to connect the dots between the game and the device itself. Train at least three times during one day, but never do it for more than ten minutes. In this way, the fetch sessions will stay a fun experience for your canine, and won’t become a fetch boot camp that your dog will despise. If you notice that your pooch is starting to get frustrated and just doesn’t want to put the ball back, just stay persistent and work on reinforcing any of the dog’s behavior towards the device. Also, make sure that you reward properly if he does what he needs to. If the pet tries to get the reward by engaging is some other sorts of behavior, like jumping up, rolling over, or shaking paws, it is really important that you don’t reward him for it. He will soon realize that only one kind of behavior can get him rewarded. If he or she is cautious around the device at first, don’t worry – the object is something new and different to him, and he’s probably not quite sure what it is. You can start the whole training by rewarding the dog for just going close, which will help him learn that the machine is just another part of the household. As the time passes, you can start giving him treats, teaching him to bring the ball as close as possible. Unfortunately, there are a lot of poor-quality throwers currently on the market. Even though some of them aren’t even worth considering, they are still priced competitively, which makes the people buy them and then get disappointed once they realize what they bought. You can easily identify and avoid these kinds of throwers – on the websites such as Amazon, they have mostly negative reviews or no reviews at all, or have the product description written in “broken” English. They are made by the unknown companies who only want the profit, and are not interested in the building of the quality brand or the customer satisfaction. 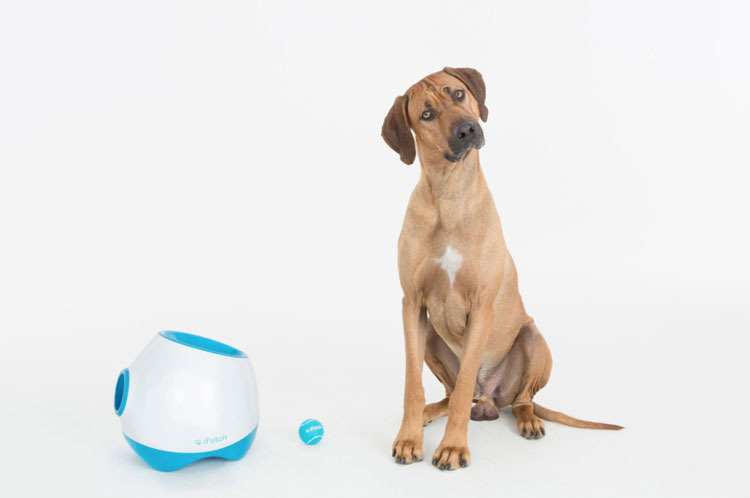 The story of the iFetch, for example, is something completely opposite – the creators of this device only wanted to make their son’s time with the dog more enjoyable, and thus made the product with lots of love and care. We would advise you to stick with the well-known, reliable brands of automatic ball launchers – they offer a huge difference in performance and quality – the iFetch, GoDogGo and the PetSafe models are all worth considering. Don’t waste your money on the knock-offs – save some cash and go for a reliable model. As you can see, Automatic dog ball throwers are simple devices but actually pretty impressive. Not only do they bring the necessary entertainment for the pet when the owner is not around to play with him, but they also improve the pet’s coordination and his health. Once he learns how to use it, the dog won’t be able to stop playing with it! In our opinion, it’s definitely worth checking out are the iFetch, both the small and the big model if you are looking for electric fetch machine and Chuckit! if you want a simple hand-held one. These sleek machines are just amazing in almost every single aspect, and it’s no wonder why they are so immensely popular. They feature a fantastic, modern design, are very easy to operate and can shoot the ball to some pretty impressive distances. The smaller model is ideal for the small and medium-sized dogs, while the iFetch Too can be an excellent choice for the entertainment of your German Sheperd or Neapolitan Mastiff. Click to read our in-depth review of iFetch – the most popular dog ball launcher pick.